Bringing back an existing lawn will take time and commitment. Most of the lawns we see are too far gone to bring back the existing grass, but a good rule of thumb is if you have 50% desirable grass left in your yard, it can be brought back. Correct poor sun light conditions by removing any trees that are creating too much shade for your grass. Bermuda sod needs 6 hours or more of direct sunlight. Zoysia sod needs 4 hours. Afternoon sun is better, so remove trees to west side or southwest side where possible. Only Fescue sod or St. Augustine sod will survive with less sun than 4 hours, but they are not usually a desirable choice for other reasons. Improve your existing soil by aerating and top dressing when needed. This process breaks up the hard surface of your lawn by “coring”it. Once there are small holes everywhere, sand can be spread to “top dress” the lawn. The sand will wash into the holes and make the surface more absorbent for water and fertilizer. How do you know if it’s necessary? Take a 6” screw driver outside and try to push it down until the handle is touching the soil. Most lawns are too hard/dry to accomplish this. Aerating breaks up the surface crust and allows better penetration of moisture and nutrients. The chemical maintenance companies are usually the best source of this service. For best results, make sure the lawn has been recently watered, not saturated, just moist. The ability to water regularly will improve your efforts because the root zone of your thinning grass is probably rather shallow. Irrigation systems offer the most consistent & efficient option. If you must use hoses, you should invest in good hoses, splitters and mechanical timers to help with efficiency. The goal is to keep the root zone moist, but never saturated. 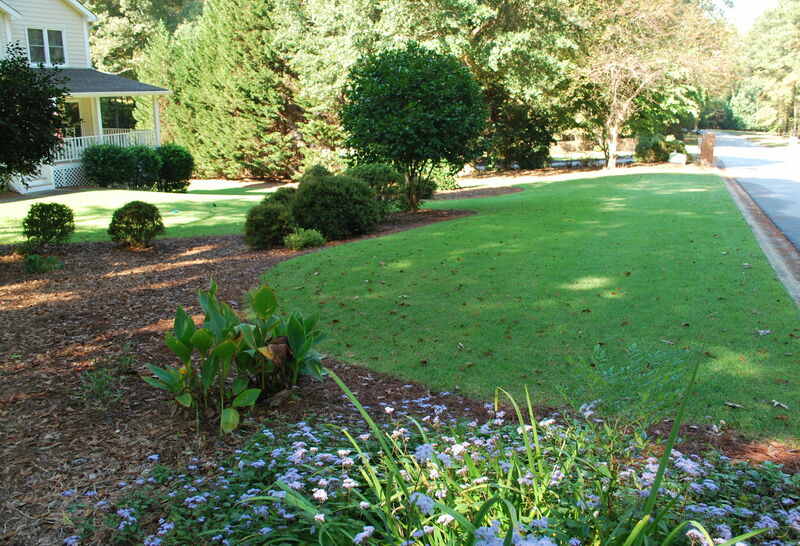 Read more in the “Are You Watering Your Sod Too Much” blog.